As I continue to shoot Meridian High School for the Northwest Conference Athletics, I feel like I’m getting back in my groove. Sports is fun to shoot. Not because it’s easy, but because it is difficult. Especially with baseball or fastpitch softball. You must anticipate the action, and when there is none, still make photos. You cannot just sleepily take a photo here and there, you must find the story of the game. 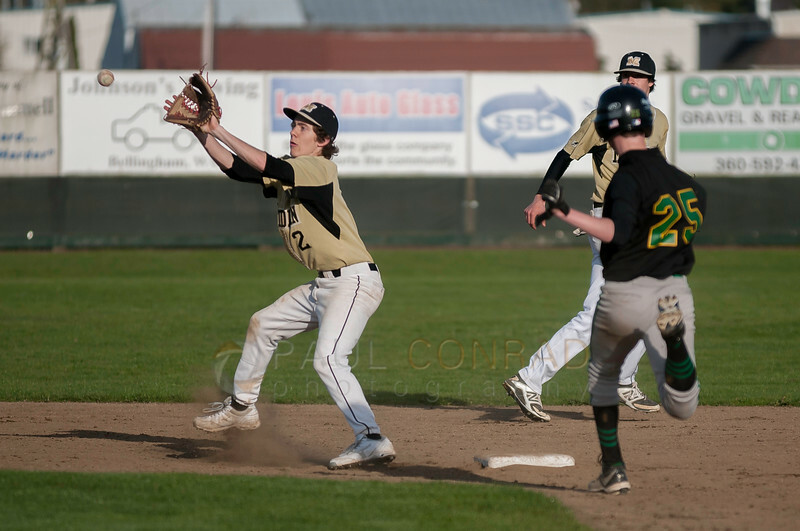 © Paul Conrad/ Pablo Conrad Photography – Meridian Trojan boys against the Lynden Lions at Meridian High School in Bellingham, Wash., on Thursday afternoon April 9, 2014. The Lions defeated the Trojans 6-4. 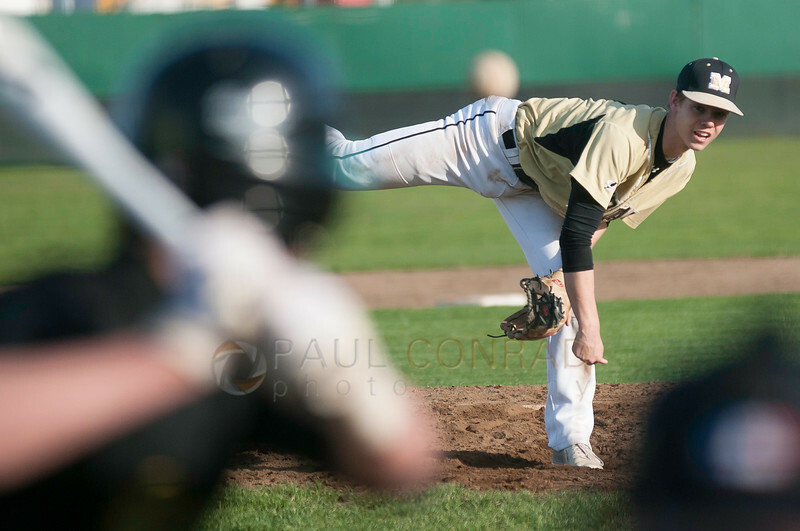 One of the things I’ve learned when shooting baseball or fastpitch is to begin with the pitchers. Yeah, you have to shoot through a fence or net, sometimes you’re lucky and get a small hole which to shoot through. But if the game turns into a pitcher’s war, getting good images of them is imperative. So you need to work the pitcher a few innings to get a few creative and good shot showing their throwing skill. Some of the iconic photos are the moment the ball rolls off the finger tips, or when they are fully extended and the ball is halfway to the plate. Paying close attention to the game is also necessary. I know it can be easy getting distracted, to get caught up chatting with folks as you shoot, but you must pay attention. One errant throw, a stolen base, a triple can change the momentum of the game. It’s also a fast play which you can miss if you are not paying attention. Because that momentum can change in an instant, being distracted can kill your chances at getting that storytelling shot. So it is vital you follow the game, watch the players, and keep an eye out for that play. For example, if you have a player at first, where will the next play be? Most probably second base. However, if the batter makes a sacrifice fly to center, expect that runner to take it to third. So pre-focus on second, but be prepared for a play at third. 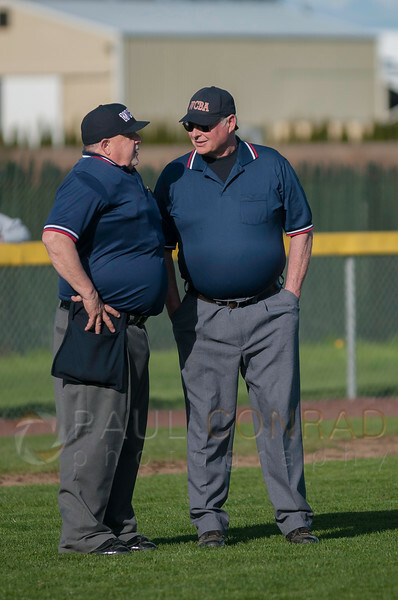 © Paul Conrad/ Pablo Conrad Photography – Umpires confer on a play at home during the 4th inning during the Meridian Trojan boys against the Lynden Lions at Meridian High School in Bellingham, Wash., on Thursday afternoon April 9, 2014. The Lions defeated the Trojans 6-4. 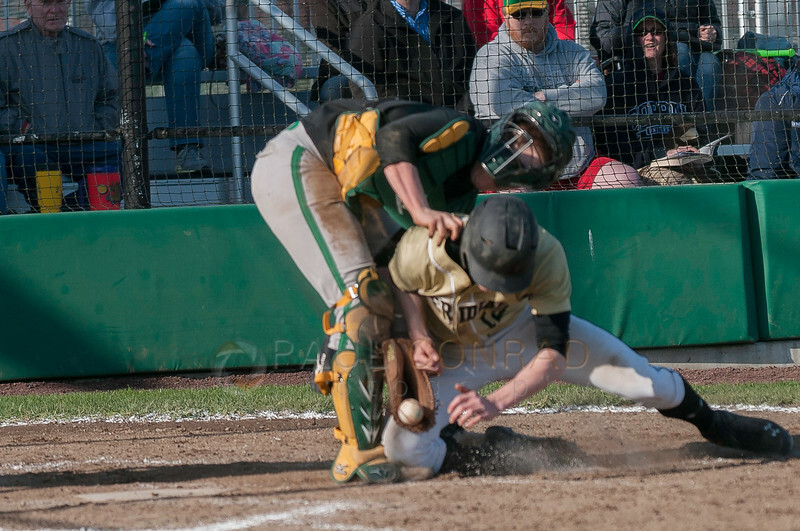 If that player is safe at third? The play will be at home. There’s no doubt about it. But pay attention to how many outs the team has. If you have a player in scoring position, they most likely will not run or attempt to steal if there are no outs. 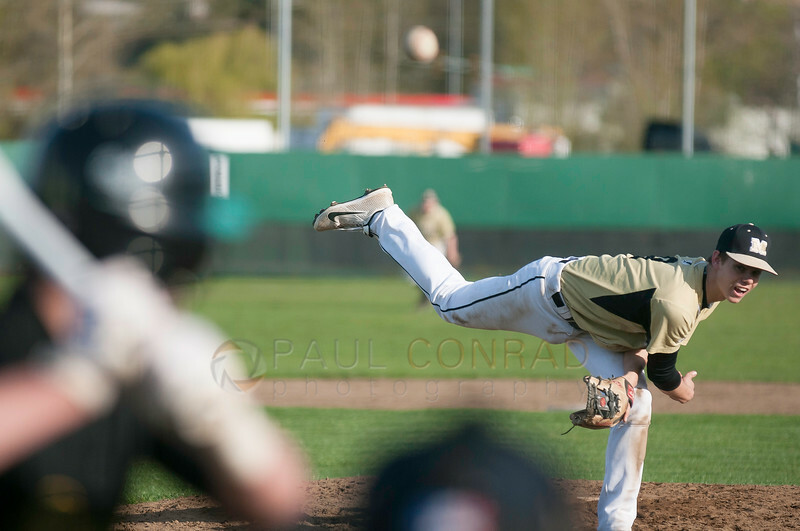 © Paul Conrad/ Pablo Conrad Photography – The relief Meridian Trojan pitcher re-energizes his team against the Lynden Lions at Meridian High School in Bellingham, Wash., on Thursday afternoon April 9, 2014. 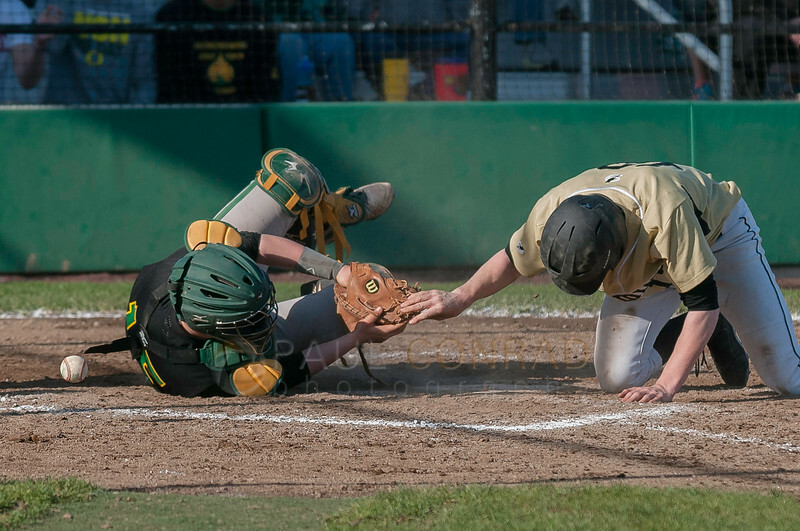 The Lions defeated the Trojans 6-4. 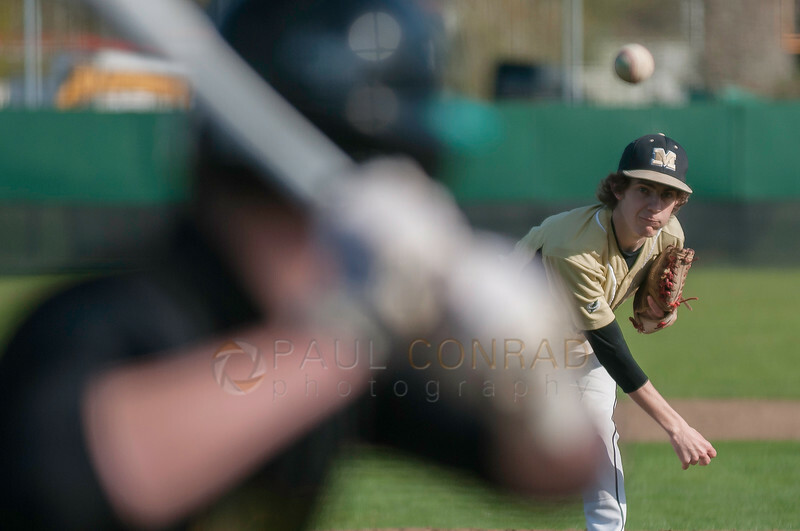 © Paul Conrad/ Pablo Conrad Photography – The relief pitcher for the Meridian Trojan boys re-energizes his team against the Lynden Lions at Meridian High School in Bellingham, Wash., on Thursday afternoon April 9, 2014. The Lions defeated the Trojans 6-4. Which suggests that learning how the team plays, coaches coach, players interact, is a good way to get the best images from the game. It may take a few games, but it’s worth sticking it out. Another is to get rosters. Identify the players in the photos. It adds a dimension to them by personalizing the images. 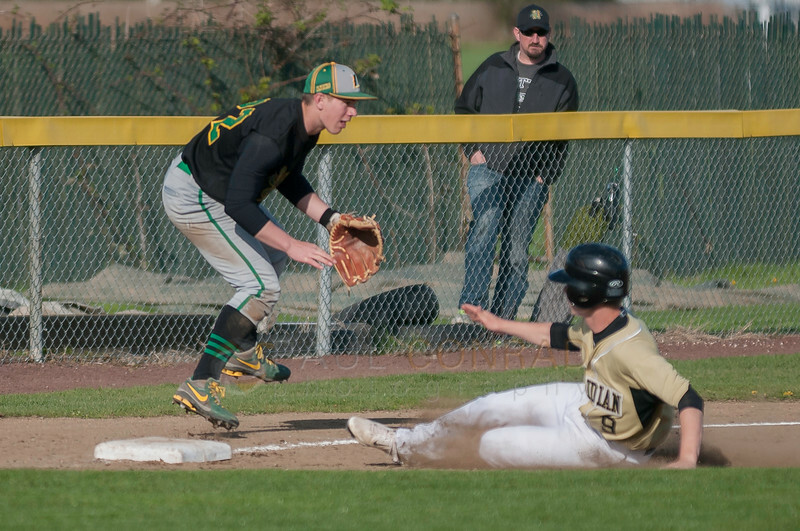 © Paul Conrad/ Pablo Conrad Photography – The shortstop for the Meridian Trojan boys attempts to stop a Lynden runner from stealing second at Meridian High School in Bellingham, Wash., on Thursday afternoon April 9, 2014. 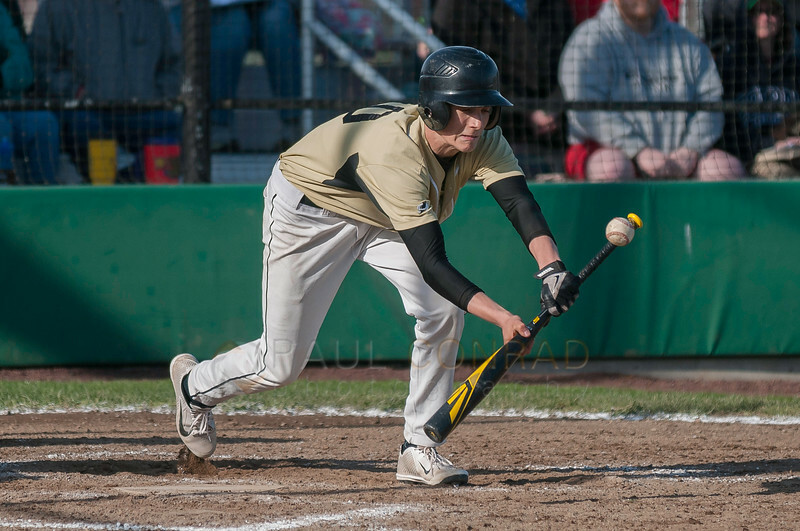 The Lions defeated the Trojans 6-4. 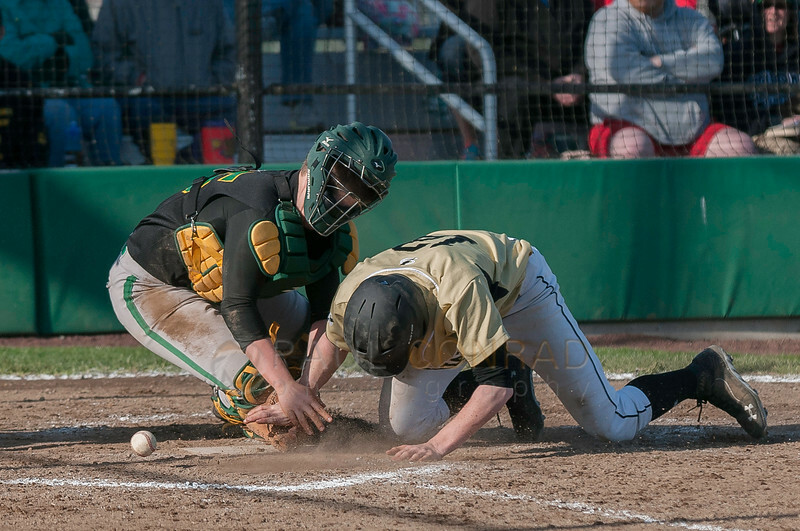 As you shoot, don’t forget about sequences such as the following photos of a collision at home plate which resulted in a Meridian score. Sure they’re easy to capture, but they can also be a powerful storytelling component. 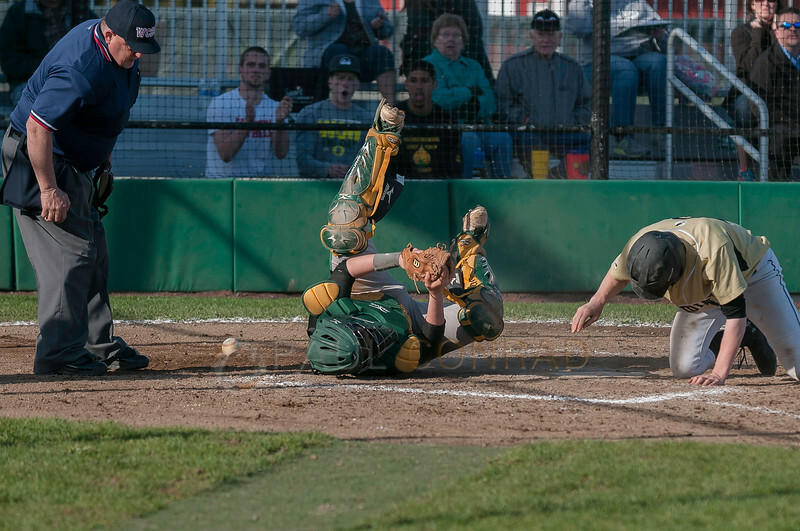 © Paul Conrad/ Pablo Conrad Photography – A Meridian runner collides with the Lynden catcher during the 4th inning at Meridian High School in Bellingham, Wash., on Thursday afternoon April 9, 2014. The Lions defeated the Trojans 6-4. 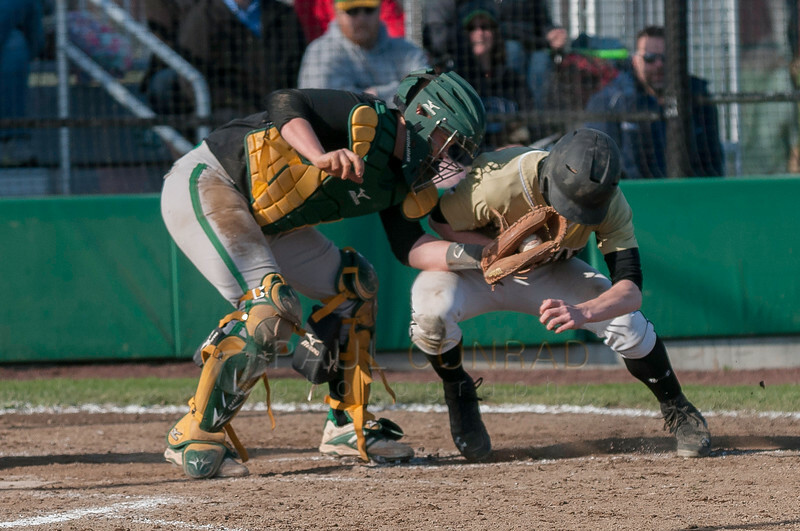 © Paul Conrad/ Pablo Conrad Photography – The home plate umpire looks for an out as a Meridian runner collides with the Lynden catcher during the 4th inning at Meridian High School in Bellingham, Wash., on Thursday afternoon April 9, 2014. The Lions defeated the Trojans 6-4. As you learn to shoot sports, your senses will hone in on the key moments which to capture. You’ll learn to START shooting at the peak and trail off therefore enhancing your chances to capture a great moment. There is extreme value in learning to anticipate moments and not rely on the speed of a motor drive to capture peak action. I know from shooting World Cup Ski racing, just because you have a fast motor, doesn’t mean you’ll capture the moment the racer will hit the “gate.” Timing is more critical. With that said, the only thing keeping you from learning is a heavy shutter finger.